1 cup contains 100 calories and 6 g of dietary fiber. Cherries are also good sources of vitamin C and minerals. Cherry contain an antioxidant known as anthocyanin which can lower high cholesterol and triglyceride levels. 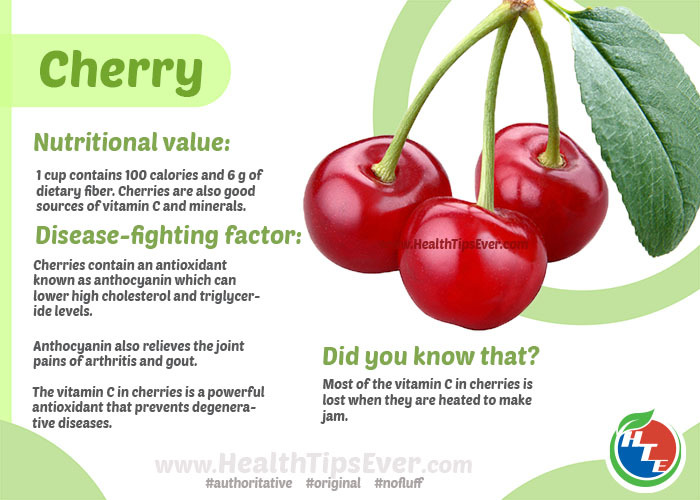 Anthocyanin found in cherry also relieves the joint pains of arthritis and gout. The vitamin C in cherries is a powerful antioxidant that prevents degenerative diseases. Most of the vitamin C in cherries is lost when they are heated to make jam.